OLF refutes the news of Galaasaa Dilboo being elected as a chairman. The so called election has never taken place in the OLF. Galaasaa Dilboo presented his resignation from the position of chairmanship and the National Council of the organization accepted his appeal and relieved him off the duty in the year 1999. Since then, Galaasa Dilboo kept aloof and has been leading his refugee life and barely was active participant in the struggle. There is no miracle that necessitates his comeback after 17 solid years. By blatantly violating the established legal procedure and organizational structure for resolving any differences that might arises, some power hungry and anarchist issued an illegal statement on December 6,2016 in the name of the OLF. Promoting, protecting, and strengthening the unity of purpose and direction among its members has always been the priority for the OLF. In line with this strategy, therefore, the OLF leadership has been tirelessly working for reconciliation and unity with those who fell out with this organization in the course of its struggle for liberation and independence. To mend the split that took place in the OLF, in the year 2000, the OLF and the OLF transitional authority (QC-ABO) have unanimously agreed to resolve their differences and unite the OLF under one: name, structure, political objective, leadership, constitution, political program and strategy in Berlin, Germany, in June, 2014. To implement this unity agreement, the political programs and the constitutions of both parties were harmonized and adopted at OLF reunification conference held in Berlin, Germany. Accordingly, appointments were made to different departments, divisions and committees through consultation and consensus. 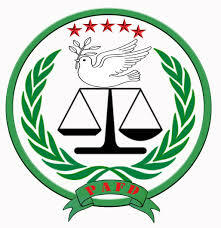 Unfortunately, as soon as the implementation of the agreement commenced, a handful of power hungry and anarchist former member of the leadership from OLF-transitional authority led by Galaasaa Dilboo, based in London, started to illegally repudiate duties assigned to them and directives issued to them by Executive Committee and the office of the chairman. Not only this, but also, they refused to participate in all regular and emergency meetings of the leadership. On the contrary, they illegally held several secret meetings of their own outside the legal forums stipulated in the constitution of the OLF. However, regardless of their obstinacy to the rules and regulation of the organization, putting the national and organizational interest above all, OLF leadership patiently and continuously made a great effort to convince them to discharge their duties and responsibilities in accordance with the agreement. Regrettably, these few individuals insisted on rejecting the tireless effort the office of the chairman and the Executive Committee made to bring them back to the organizational modus operandi agreed up on. After exhausting all means at its disposal, Executive Committee of the OLF, decided to forward their case to the National Council of the OLF for deliberation and decision. Consequently, the National Council held a meeting, discussed the issue and unanimously agreed for the Audit and Legal Committee of the organization to talk to those individuals and report back to the council on the way forward. But, the effort made by this committee was also rendered fruitless because of their intransigence. Not only this, the National Council also formed a committee that was tasked with inviting them to the National Council meeting that was intended for the problems they alleged to have to be discussed and resolved amicably. 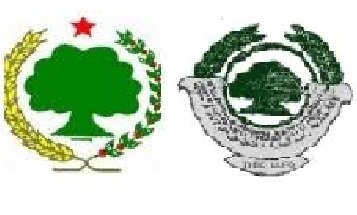 With a complete disregard for the unity the current situation demands and unreserved effort the leadership of the OLF made to peacefully resolve their alleged problem, these individuals also rejected the invitation extended to them by this committee and finally decided to divorce themselves from the OLF by their own volition but regrettably, embarked on unwanted destructive and unpatriotic activities. One of the destructive and unpatriotic activities they engaged in is the statement they issued on December 6, 2016 in the name of the OLF. Since the information and the decision contained in it are distortive, illegal, atrocious and confusing in time such as today when our people are in dire need of unity of command and direction, the OLF denounces this statement with the strongest term possible. 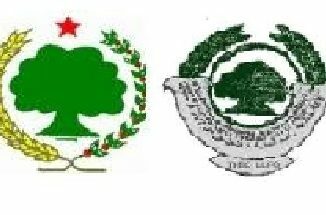 Therefore, the OLF would like to call up on: all its members, supporters, the Oromoo people, friends of the Oromo, to treat this statement with the contempt it deserves and reject all decisions passed and activities carried out by this illegitimate group. They should only engage with the official and internationally recognized OLF led by Chairman Dawwud Ibsaa. In particular, we want to assure all our members that the majority of OLF leaders are united and preparation is at an advance stage to conduct its regular National Council meeting. As the result, we urge all our members and supporters to remain calm and continue with their national task of implementing the national liberation programs laid out by their vanguard organization, the OLF. Finally, we hold accountable all those media houses who are at the for front in disseminating only one sided distortive and confusing information in the name of OLF, without seeking any clarification from the proper OLF leadership. 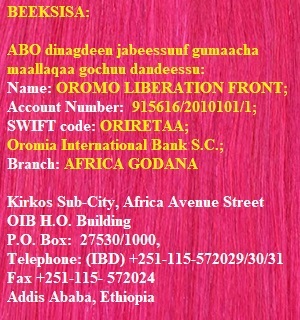 We want to remind them that they should be: balanced, impartial and patriotic in their coverage of Oromo issues. 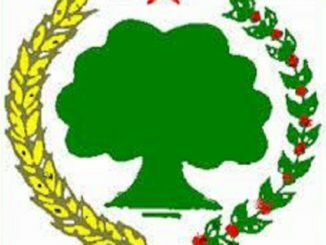 Victory to the Oromoo People!